A happy-go-lucky Walrus escapes the zoo in search of adventure in this wordless instant classic. Stephen Savage is the New York Times bestselling illustrator of the highly acclaimed and award-winning picture book POLAR BEAR NIGHT, written by Lauren Thompson, as well as the creator of WHERE'S WALRUS? He creates illustrations for a wide range of publications, including The New Yorker, the New York Times, and Newsweek. Stephen lives in Brooklyn, New York, with his wife and their daughter. Elementary-school children relish the challenge of finding visual clues in picture books, hence the popularity of intricately designed puzzle series such as \u0022Spot Seven,\u0022 \u0022I Spy\u0022 and \u0022Where's Waldo?\u0022 Younger children enjoy the hunt too but, being smaller, generally need less complicated images on which to test their wits. 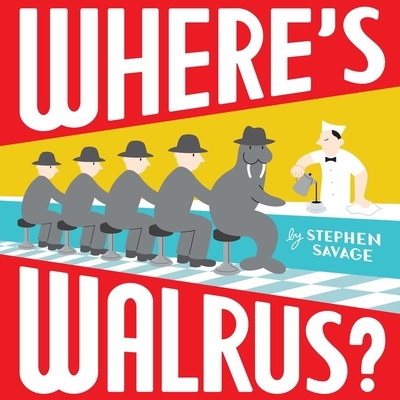 Stephen Savage's picture book \u0022Where's Walrus?\u0022 (Scholastic, 32 pages, $16.99) is an especially funny and stylishly retro-looking option for this nursery-school crowd. In its clean, colorful pages, a walrus escapes from a pool at the zoo while his keeper snoozes. When the man eventually gives chase, the walrus eludes capture by cleverly blending into various city scenes. On the cover, for instance, we see him wearing a fedora, smiling tuskily at us from a diner counter, where he is getting a cup of coffee. He poses with mannequins in a shop window, lays bricks with a row of workmen, insinuates himself into a line of firemen and dances onstage in a string of showgirls. The keeper catches up just in time to see the walrus infiltrate a diving team and perform a somersaulting high-dive (which little children will enjoy tracing with their fingers). When the walrus wins both applause and a gold medal, the keeper conceives of a brilliant idea—think big pool and diving board—for keeping both the animal and zoo visitors happily entertained in the future. A sleeping zookeeper, wide-open gates, a clever walrus—a slow day at the city zoo is about to get a lot more interesting. In this wordless look-and-find book, the walrus escapes from his small pool and heads out the gates; the now-alert zookeeper immediately sets off in pursuit. But everywhere he looks, from the fountain to the diner, from the construction site to the theater, the walrus is nowhere to be found. Or is he? With the right headgear and attitude, the walrus hides easily in plain sight over and over again. Preschoolers will love being one step ahead of the clueless zookeeper, who doesn\u2019t notice the fountain\u2019s new mermaid statue or the store mannequin with tusks or the stage dancer with flippers and a tail instead of feet. Savage\u2019s stylish digitally created illustrations feature clean shapes, strong lines, and solid blocks of color. The graphically appealing scenes are easy to read, allowing even the youngest viewers an opportunity to interpret the action. The silly search comes to an end at a diving competition, and when the gold-medal winner\u2019s swim cap comes off, the poor zookeeper finally gets a clue…and an idea for how to keep the walrus happy and boost zoo attendance. The satisfyingly circular ending gives Where\u2019s Walrus? a flipper up on that guy in the striped shirt. In this wordless picture book, an adventurous walrus slips out of the zoo as the keeper naps, and the enterprising marine mammal leads his would-be captor on a merry chase through the city. After successfully hiding himself amid group after group of people, he finally tips his hand—flipper?—by winning a diving contest; the thoughtful keeper then creates a happier home (and a zoo showpiece) for the walrus by providing him with his own diving board and regulation pool. The visual gag of the walrus’s blending into various lineups merely by adding an accessory (a plume on his head means the zookeeper can’t find him amid the Rockettes, a hard hat is sufficient to disguise him in a line of bricklayers, and it’s the removal of his diver’s bathing cap that finally outs him to his pursuer) is an amusing one, cleverly conveyed, and while there’s not much plot beyond that, it’s still a giggle-worthy and creatively interpreted conceit. The trim illustrations are digitally created, with the smooth regularity and crisp clarity common to that medium, but there’s a generous helping of Little Golden Book retro style that gives a period flavor to the escapade. The palette, carefully limited in each spread, sports muted shades of aqua and navy in addition to its predominant gray, but the creamy white of the matte pages ensures that the spreads stay bright and sunny. The shapes balance sturdy rectangles with the rounder shapes of people and Walrus, with Walrus’ odd-critter-out status visually emphasized by the droll Fisher-Price sameness of the humans among whom he’s attempting to secrete himself. The read-it-yourself wordlessness, visual humor, and sheer absurdity of a walrus’ urban adventures will surely appeal to youngsters with a taste for the incongruously silly.